Electric Cooperatives - special discounts for members of the NRECA. Our relationship with Electric Cooperatives has been so agreeable that we have decided to extend an across the board 10% discount to all members of the National Rural Electric Cooperative Association. We have long recognized that the professionalism of members of the National Rural Electric Cooperative Association makes our job easier and more profitable. 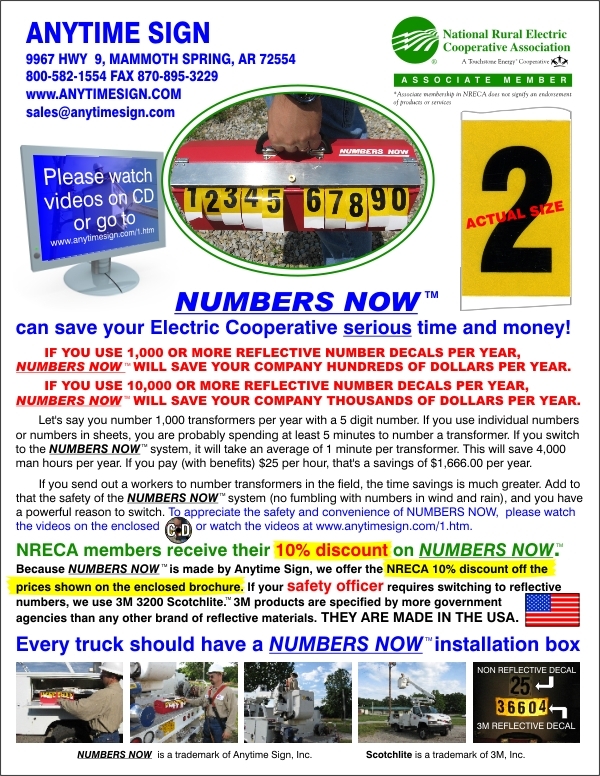 Anytime Sign values the business of members of the NRECA. This discount program is being offered solely by Anytime Sign Company and not in conjunction or affiliation with the National Rural Electric Cooperative Association. NRECA does not endorse or approve, nor does the appearance of the NRECA logo on this web site represent any endorsement of or affiliation with Anytime Sign.